Over on the LimeSDR facebook group Marty Wittrock (KN0CK) has been experimenting with his LimeSDR and SDRAngel. SDRAngel is a general purpose SDR program similar to SDR#/HDSDR/SDR-Console etc, but with the key difference that it is designed to incorporate TX features as well. SDRAngel has releases available for Linux and Windows. 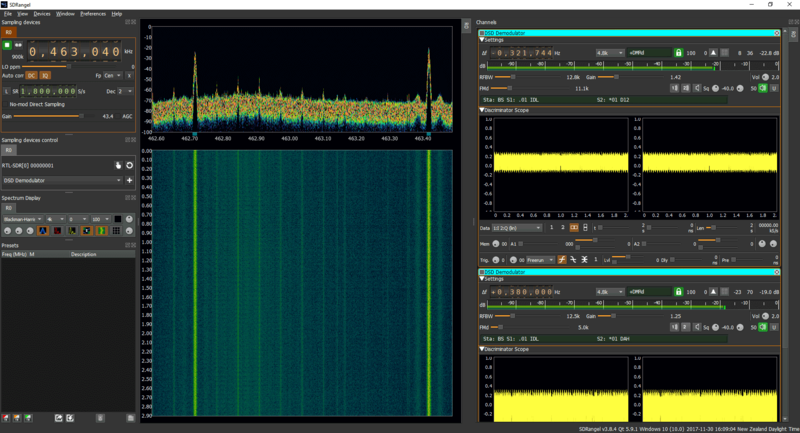 Marty writes that in early August SDRAngel programmer Edouard (F4EXB) resolved most of the issues with LimeSDR compatibility and now TX and RX in SDRAngel with the LimeSDR works great. LIMESDR/SDRANGEL UPDATE: Yours truly the mad scientist, playing with the LimeSDR on HF at 7.0 MHz here within the shack (no external antennas applied) TRANSMITTING NO DELAY ON HF LOWER SIDEBAND USING SDRANGEL AND THE LIMESDR..!! FINALLY, an app that supports receive and transmit for the LimeSDR is available free of charge and WORKS PERFECTLY..!! See it for yourself on the attached video…And I do have the recipe for this since it’s on Linux (Ubuntu 16.04) for now…A Windows 7/10 build IS planned…A RED LETTER DAY FOR THE LIMESDR..!! #LimeSDR #SDRAngel #HF 🙂 ! !